Assorted Donut Muffins and Project Food Blog: Vote Now! Willow Bird Baking is a contestant in Project Food Blog, a contest comprised of a series of challenges to find the next food blog star. 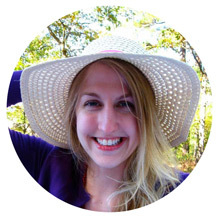 If you missed it, my first challenge post explains why I blog, and what makes WBB special. Voting for Challenge #1 is now open! To vote, register for a Foodbuzz account. Once you’re registered, sign in and go here. To vote, click the heart next to the words “Vote for this Entry.” I am so grateful for your support! At this point, just about all of us have either made Donut Muffins, eaten Donut Muffins from a generous friend, bookmarked a recipe for Donut Muffins, drooled over photos of Donut Muffins, or cursed the day Donut Muffins were invented as we kicked our scales across the bathroom. I was in the “bookmarked the recipe” category for way too long. Every time I’d see another Donut Muffin post pop up in my Google Reader, I’d admonish myself for not having made them yet. They’re billed as warm, pluffy cake-donut-like muffins that have soaked up butter before being coated in cinnamon and sugar. It’s basically criminal that I hadn’t made them until this past weekend. But don’t worry — I made up for lost time. What’s the fun of donuts? The taste, definitely — but also the puff of powdered sugar, the jam centers, the colorful sprinkles, the melty chocolate, the sticky glaze. 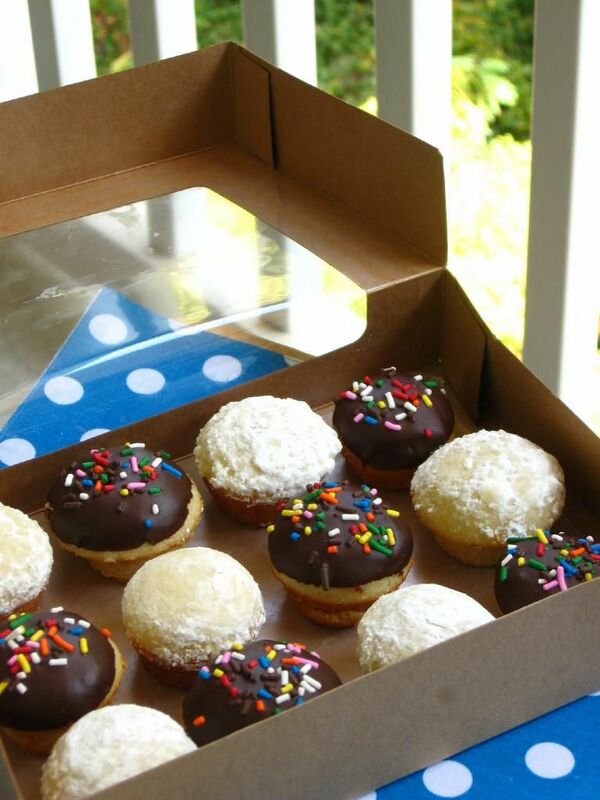 A major component of what makes donuts so fun is the assortment. Even though I have a favorite donut, I always buy a few kinds so that I can pick through the box excitedly, tasting different combinations and flavors. So why make just one sort of Donut Muffin? Especially when it’s so easy to make a few kinds? In my Donut Muffin assortment: Caramel Apple Donut Muffins, Jam-Filled Powdered Sugar Donut Muffins, and of course, Chocolate Sprinkle Donut Muffins. You start out by making the batter like normal, but then separate a third of it to add diced apples to. After baking all the muffins up, the apple donut muffins get coated in cinnamon, sugar, and a caramel glaze. Another 1/3 of the batch gets coated with powdered sugar and filled with raspberry jam. The final 1/3 gets a bath in melted chocolate and some sprinkles. I bought a box of bakery cookies just to have a cute little “donut box” to put them in (no clue what I’m going to do with those cookies)! The Chocolate Sprinkle Donut Muffins were good — but next time I’ll fill them with whipped cream or pastry cream for more donuttiness (that is a Merriam-Webster-certified real word, y’all. Okay, it’s not. Not even close). The Jam-Filled Powdered Sugar Donut Muffins were delicious little jammy bites. But the Caramel Apple Donut Muffins . . . they were OUT OF THIS WORLD. Like, OUT OF THIS GALAXY. Like, OH MY GOODNESS. My roommate had to sit down when she took her first bite, and she insists they’re the best thing I’ve ever made. Are you dicing apples yet? Good. When they’re warmed up slightly, full of apply, buttery, cinnamon-sugary goodness, and coated with the buttery caramel glaze, these fluffy Caramel Apple Donut Muffins are analogous to the donuts you’d drive across town for. Sure, you want the assortment — and I ate plenty of the other two tasty flavors — but these are the ones you’d keep coming back for. By the way, are you afraid of caramel? That’s probably because you’ve been using recipes with directions that say things like “look for an amber color,” or, even better, a “dark amber color.” I don’t know about you, but I think “amber” is pretty subjective. What gives? We stopped using terms like “low oven” and “slow oven” in recipes long ago in favor of fancy little things called oven temperatures. It’s time we switched over our sugar recipes to include temperatures as well. Caramel is nowhere near as frightening with a candy thermometer, y’all. You’ll be glad to see I’ve provided temperatures for your caramel sauce below, since I’m not feeling prehistoric. What’s your favorite kind of donut? I think mine changed with my first bite o’ Donut Muffins! The recipe below shows you how to make all 3 kinds at once, but feel free to make just one sort if you’re feeling decisive. Recipe by: Willow Bird Baking, adapted from the base recipe by Buns In My Oven. Caramel sauce by Martha Stewart. Prepare two mini-muffin pans by spraying with cooking spray. Preheat the oven to 350 degrees F. Beat sugar and egg together in a large bowl until fluffy. In a smaller bowl, whisk together flour, baking powder, salt, and nutmeg. Pour dry ingredients into wet ingredients and stir until combined. Add vegetable oil, milk, and vanilla extract and mix. Separate 1/3 of mixture into separate bowl and fold in diced apples (these will be the Caramel Apple Donut Muffins). Pour all batter into prepared muffin tins, filling each about 3/4 full. Bake for 13-15 minutes until tester comes out clean. Let cool in the pan for a few minutes before removing onto a cooling rack (if muffins are extremely delicate and difficult to remove, you may need to bake them a minute longer — mine weren’t quite done enough. On the cooling rack, separate the donut muffins into 3 batches: the apple muffins, 1/2 of the plain muffins, and the other half of the plain muffins. 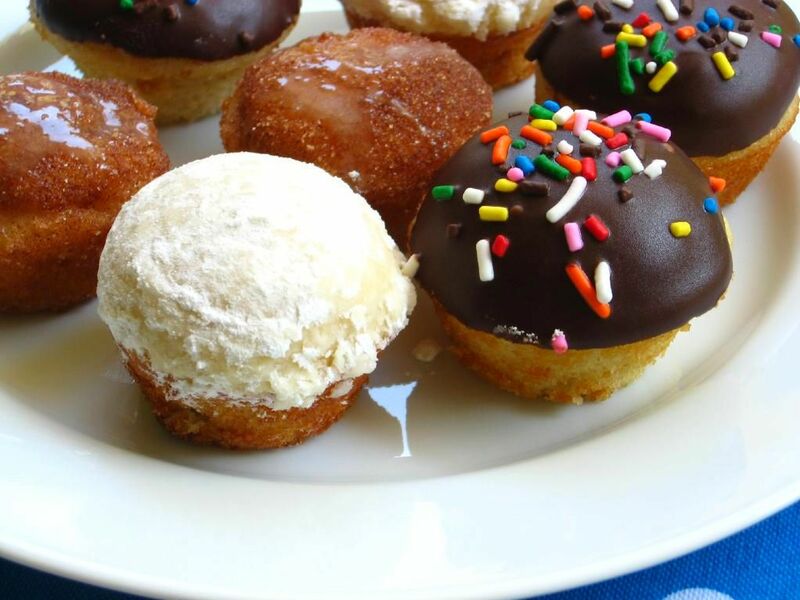 These will be your three types of donuts. 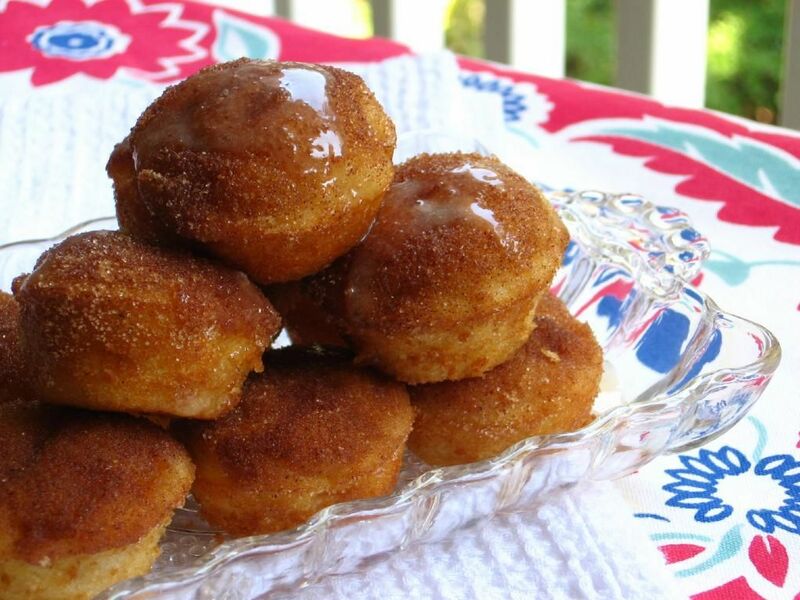 For the Caramel Apple Donut Muffins: Melt the butter in the microwave and mix the cinnamon and sugar in a separate bowl. When the muffins are cool enough to handle, dunk the tops into the melted butter and then into the cinnamon-sugar mixture. Let dry/cool on cooling rack as you prepare caramel sauce (as directed in recipe below). Store caramel in fridge and drizzle on heated Apple Muffins right before serving. For the Chocolate Donut muffins: When the muffins are cool enough to handle, dunk the tops into the melted chocolate. Add colorful sprinkles. 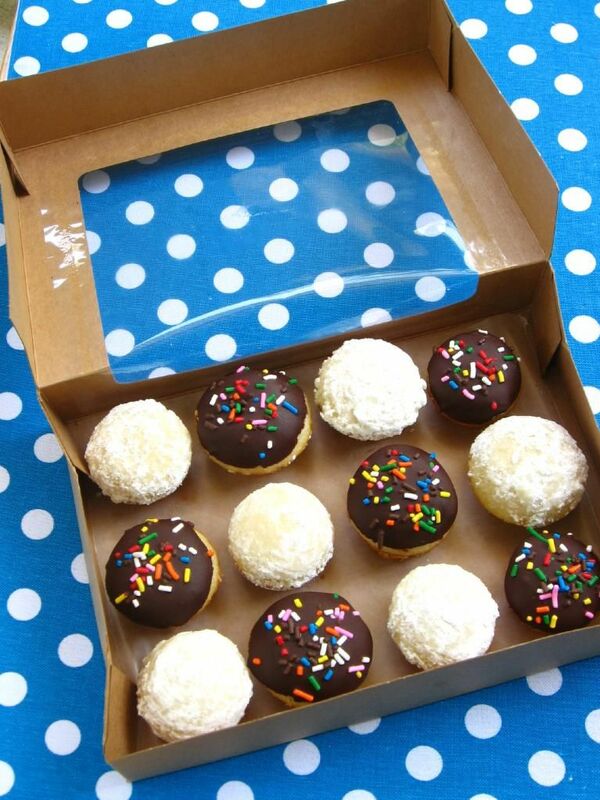 You could fill these with pastry cream or whipped cream using a narrow pastry tip inserted into the bottom of the muffin if you wanted a cream-filled donut muffin. For the Jam-Filled Powdered Sugar Donut Muffins: When the muffins are cool enough to handle, dunk the tops into the leftover melted butter and then into sifted powdered sugar. 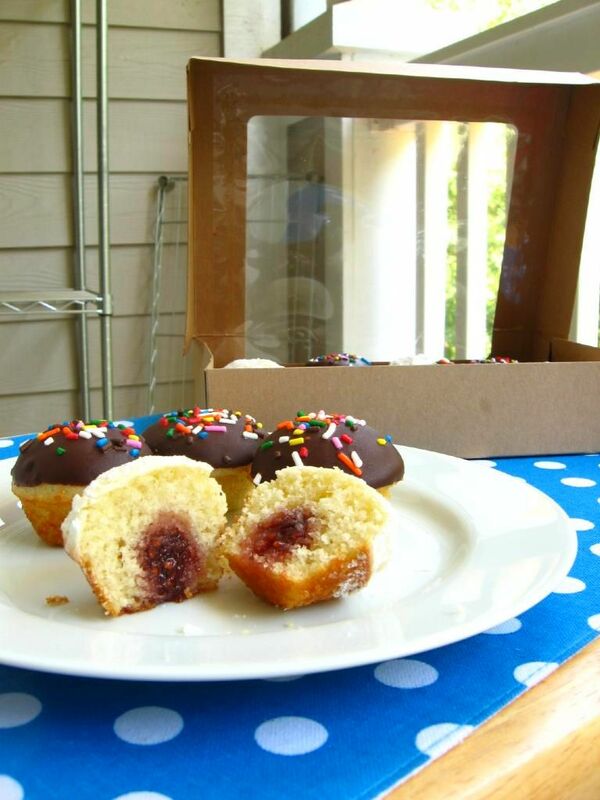 When donuts are cool, fill them with raspberry jam using a small pastry tip jabbed into the bottom of the muffin. Be careful not to overfill and burst your muffin (that should definitely be a more popular idiom than ‘burst your bubble,’ don’t you agree?) 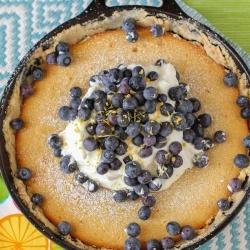 You may have to re-powder tops before serving if you keep these overnight, since some of the powdered sugar dissolves. NOTE: Store all your muffins in an airtight container in the fridge. NOTE: This makes more caramel than you need, but I don’t reduce the recipe because it would make it difficult to use a candy thermometer, a tool that I believe is absolutely crucial in preparing caramel. I know you can find something else to spoon caramel sauce over — and this is truly delectable caramel. Prepare a bowl set in an ice-water bath. Place sugar and water in a saucepan and heat over medium-high heat until it boils and the sugar is dissolved. Throughout this process, use a wet pastry brush to wash down the sides of your saucepan often to prevent crystal formation. Reduce the heat to medium and cook until the mixture reaches 345 degrees on a candy thermometer (begin swirling gently when you see hints of amber, so the sugar cooks evenly), about 5-7 minutes. Immediately remove from the heat and add cream carefully (the mixture will bubble up) while whisking constantly. Return mixture to medium heat until it boils and sugar melts. Remove from heat, and pour into the bowl set in your ice-water bath. Let the caramel cool, whisking often, for 10 minutes before whisking in creme fraiche, vanilla, and salt. 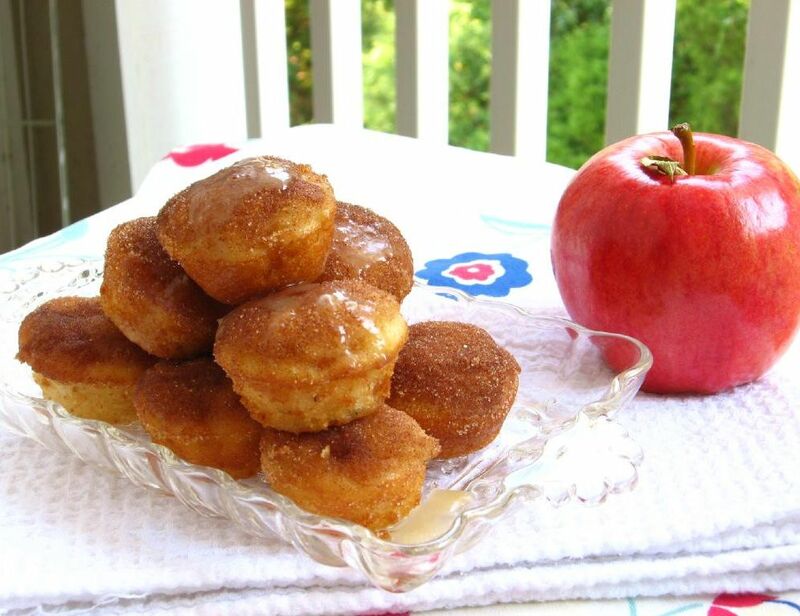 Cover and refrigerate at least 2 hours before serving over Caramel Apple Donut Muffins. Can store in the refrigerator for up to 5 days. 51 Comments on Assorted Donut Muffins and Project Food Blog: Vote Now! I’m rooting for you! So exciting. Looooove all the varieties you’ve got here! I’m going to be trying those Caramel Apple donut muffins soon! Your post did make me think of it, Brittney! It’s such a pet peeve of mine! Crazy recipes! 🙂 Thank you! I was in your boat before reading this post. The bookmarked boat. And the drooled over boat. And I’ve kicked my scale across the room a few times lately. But not because of these. Although I need to make these, specifically these caramel apple lovelies, imminently. So I’m sure that scale will be going across the room, yet again. Thank you, Joanne!! I hope you LOVE them — they were so, so yummy! Now I’m dying for a donut and I only just started a much-needed diet today. I’m going to have to be strong and just continue reading and drooling over your blog without giving in to temptation! I was going to try your recipe for home-made branflakes at the weekend but couldn’t find bran or almond flour; it’s amazing how the ingredients for unhealthy stuff are far easier to find! So true! You can actually just grind almonds for the almond flour (use the same volume almonds as it calls for flour), but the bran is another story! It’s also called “wheat bran” and can be found at health food stores if not in the regular grocer. Sorry you’re having trouble finding it!! Even though they got your lowest rating, I really want to try the chocolate sprinkle doughnut muffins! And all of them look fabulous. Love the cute bakery box too! now i am feeling bad that i haven’t tried them yet! love your flavor combos. These look delicious to a dieting person! 🙁 I bet they ARE delicious!! My favorite donuts include the regular glazed, the glazed donut with the chocolate icing on top and the chocolate cake donut. If I’m feeling adventurous I’ll get a blueberry cake- ooh! I LOVE those blueberry cake donuts, Monica! Yum! But my favorite are original glazed, too! Go Julie Go! 😀 These look lovely! I made a version of these and they went down a treat! Oh my goodness, I have to go see!! Thanks, Lorraine! Lesson number 1: Don’t be afraid to make caramel, it’s so worth the work! Julie, these look sooooo incredibly delicious. I adore caramel so I know I would be grabbing those first, second, and last. Good luck in the competition, I voted for you! Agree — so worth the work! Thanks so much, Julie! Hurray, I’m so glad you tried them! They’re definitely one of my new favorite treats. Donut muffins just seemed destined for apples and caramel to me, for some reason, so I had to get creative 😉 I think it’s the cinnamon — it was just callin’ for some fall apples. Thank you for letting me know you loved them!! I totally just drooled on my keyboard. I *will* be making these very soon…. Those really are adorable! Great photos. Voted! Also LOVE this mini donut muffin post. They look so good. I’ve made donut muffins before, and they were just kinda okay to me. But those caramel apple ones, my dear, gosh, I don’t even know where to begin. What a great idea! I’m definitely giving that one a go the next time. Thank you!! The caramel apple ones are exxxxxxtreme!! So good! One negative of this assortment is that I didn’t even try the originals! Sad! I’ll have to make them sometime to see how I feel. I’m eyeballing my apples to see which ones to sacrifice for these donut muffins. They look so good! OH. MY. Am still in the bookmarked category, trying hard not to move to the cursing-the-bathroom-scale category. Love the variety. That totally IS the best part of donuts! It’s a slippery slope from one category to another! 😉 Thanks! way to take these to the next level! this is why you deserve to win the competition! 🙂 great job!! Aw, so sweet!! Thank you so much! OMG, no I have NEVER made donut muffins but I AM kicking the bathroom scale across the floor right now! HA, I love it! Preemptive scale kicking!! Oh, snap! Caramel apple donut muffins?! I’m in agony here…I was intending to make an apple cake but now I just don’t know! They’re SO good, Ingrid! 🙂 Maybe you can make both, even! How fun! and creative! I can’t wait to try this out on my nephews and neices! 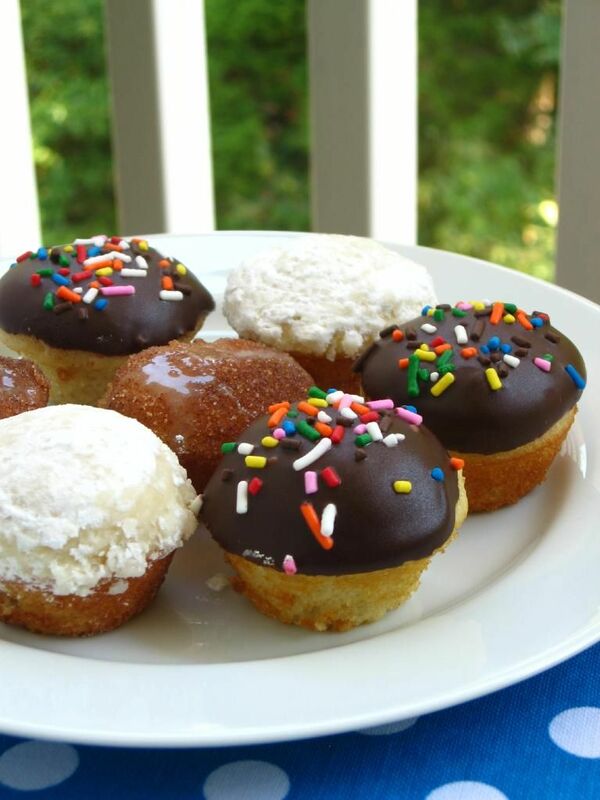 1Pingbacks & Trackbacks on Assorted Donut Muffins and Project Food Blog: Vote Now!